PanARMENIAN.Net - Head of the Special Investigative Service Sasun Khachatryan declared on Tuesday, September 11 that the Armenian Armed Forces opened fire towards the balconies of residential buildings in Yerevan on March 1. Khachatryan and the Director of National Security Service Artur Vanetsyan are giving a press conference after their phone conversation about the investigation into the incidents of March 1, 2008 leaked online on Tuesday. 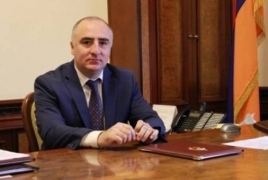 Second Armenian President Robert Kocharyan and the Secretary General of the Collective Security Treaty organization (CSTO), Yuri Khachaturov were indicted by the Special Investigative Service. SIS, which reports to the prime minister, is investigating the deaths of ten people killed amid the violent dispersal of anti-government protesters 10 years ago. According to Khachatryan, the soldiers started shooting after a burning bottle was thrown from one of the balconies.